It seems everywhere you look the coal industry's 'supercycle' hype fails to match reality. Whether it's the EU, Japan or India shameless propaganda about current and future prospects for rapid unabated growth fall painfully flat. But surely this couldn't also hold true for China, the world's largest consumer of coal? As it turns out, yes it does. The truth is Chinese coal consumption is peaking and its plans to build the world's largest coal pipeline is a bubble that may have already burst. Before we get to the fun stuff let's start with the scary part. 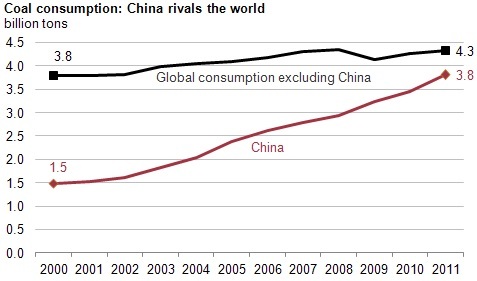 China has nearly singlehandedly driven the dramatic increase in global coal consumption over the past decade. As a result China now consumes 47 percent of the world's coal. The worst part is it seems, at least on paper, that this trend is only beginning as the country is also home to the largest coal plant pipeline in the world. Scary stuff. But it turns out, as always, there is much more to this story. And, as always you rarely hear this version. Let's start with the first bit of hot air to fill this bubble, the one I hear over and over again: Isn't China building a new coal plant (or two or three or four) every week? No they aren't. While it's true China has been on a spree over the past decade it turns out that the industry is now running on fumes (no pun intended). In 2011 a full one-third of coal plants approved in the country were stalled and investment in new coal plants weren't even half the level they were in 2005. Even better, China actually closed down over 80 GW of coal plants between 2001-2010 and is planning to phase out another 20 GW. To put that in perspective that's roughly the size of ALL electricity sources in Spain home to the world's 11th largest electricity sector. So next time someone tells you China is building a new plant every week, you can pleasantly respond: bullS*%@! Why has investment fallen off so dramatically? A big part of the reason is that coal plants are simply not making money. In fact for most of the last five years almost all of them lost money. That's because building new coal plants is far more expensive than you think, and the cost of the fuel to supply those plants (coal itself) is volatile and rising (for more on why this is happening check out the Sierra Club's report Locked In: The Financial Risks of New Coal Fired Power Plants in Today's Volatile International Market). On top of all that the coal producers, coal consumers, and the railways in China are locked in mortal combat over who gets the lions share of wealth generated by the industry. All factors that conspire to reduce confidence in the sector and hence investment flowing to the planned expansion of coal in China. So where is investment going? Renewables, renewables, renewables. 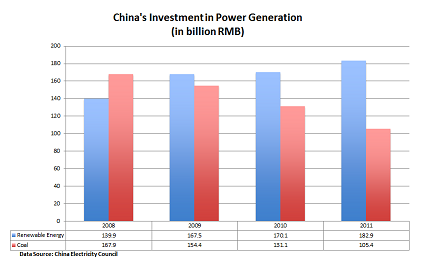 Since 2009 renewable energy investment has outpaced coal investment in China. Even better, the gap between each is growing. In fact, wind alone outpaced new coal plant investment in China in 2012. Money talks, and in China it's increasingly saying renewables. We could of course take this a step further and analyze all the factors that may conspire to hasten the fall in Chinese coal consumption in the near future. That would include catastrophic air pollution, a ban on low quality coal imports, the notion of capping coal consumption altogether, severe water constraints and perhaps even an absolute carbon cap in the near future. All in all I'd use two words to describe coal's future in China: Uncertain and Risky (US exporters take note). But at the end of the day we don't need to justify future projections - we just need to point to what's already happening. The world's biggest coal consumer is losing its appetite because coal is becoming more expensive, investment is going down, and competitors are growing rapidly. It appears the Chinese 'supercycle' propaganda is just like all the rest, an industry myth meant to fuel a bubble that may have already burst.